Profession: Primary: Chef - A Chef, Cook, Bartender or any other distinct related profession gives kitchen skills and knowledge about food, flavoring, ingredients, drink, and nutrients. They are masters at making the most out of whatever ingredients are available, and know how to create a balanced diet for the crew that will keep everyone in fighting trim. Chefs can also create foods which strengthen those who eat it, granting buffs to their allies. Hair: Due to how the genetic lottery for fishmen are, Marlin inherited a quirk that came from his grandparent who was a Sea Anemone fishman and gained their hair. In place of regular hair are sea anemone tentacles, though they do not have any stingers like normal and are more just cosmetic in appearance. They are rather ticklish though when touched, and other than that, there is no hair anywhere else on his body. Eyes: His eyes are rather round like that of a shark's and have black pupils. However he has a more human look with his eyes as their is a slight slant, yet another genetic quirk from his family's background with a human-like merman in his ancestry. Clothing/Accessories: As a member of the marines, Marlin tends to wear the typical Marine uniform, albeit a slightly larger one that accommodates his size with slightly looser sleeves so the fins on his arms don't get caught. General Appearance: Marlin is rather lithe for his size, though he has quite some weight due to his fishman genetics. Being a Blue Shark fishman, he is primarily blue skinned over most of his body with some pale skin on the parts of his body that would be considered the bottom half of a shark. Much of his body has traits from all sorts of ancestors and family members in his past due to how fishman genetics work. He has pointed ears from an ancestor who was a dogfish fishman, though they do not give him any real benefit. His face would be considered very handsome by human standards, though he inherited his facial features from his maternal grandmother, who was known to be a mermaid of renowned beauty. However, he has sharp shark-like teeth inside his mouth that are capable of tearing into flesh. His mouth is not particularly big compared to other shark-like fishmen though, and is human-like in shape. He has rather sleek muscles on his body that enable him to swim rather fast, though has hidden strength underneath. On his arms are small fins that enable him to adjust his swimming and increase his speed if necessary. His hands and feet are slightly webbed like a normal fishman, though he has no dorsal fin like many fishmen of his type. Personality: Marlin is what one might call "chill." He tends to be very relaxed and take things at a nice pace, preferring to not finish right away but rather slowly work on things over time. He is very calm and patient in almost all sorts of matters. However, he has a bad habit of eating or smoking fried kelp that he makes himself, which he claims makes him feel more at ease and relax more. He is willing to share the fried kelp with others, though he often fails to forget that it seems to have no real benefit for anyone that is not a fishman due to their differences in body type. As a chef though, he takes his job seriously and in the kitchen is a focused person. In his opinion, one must be a cook and take it seriously lest they poison someone or make someone sick with their food. Marlin believes in making food to help people feel happy, feel better, or even feel stronger. Not surprisingly, his specialty is seafood and surprisingly, his other specialty is baked treats like cookies and brownies. He loves making food for others and will never turn down anyone who is starving, even if they happen to be pirates. Many would consider it odd for Marlin to be a member of the marines as there are so few fishmen in the organization, and many do not know any who willingly serve. While there is a small part of him that hates the World Government for allowing the slave trade that often affects his people, he thinks that they can be redeemed. Sometimes the devil you know is better than the devil you don't, and Marlin believes he can make a positive influence in the Marines and bring about change in a more positive light. However, he believes in "Lazy Justice", which is something he vaguely heard about that some admiral in the past followed. He did not really know what it was about, other than that it sounded good by nature and it seemed like the "chill" thing to do. However, when it comes to paperwork, he is very good at being on time and doing everything necessary, something that makes him be seen as reliable despite his nature. Marlin has a fondness for making jokes and commenting about situations in a humorous way. He claims humor is the best way to defuse a serious situation, though he hates it when he is told his jokes are terrible. There are few things he dislikes, though he doesn't like being called a fish or a monster by humans, even in the marine forces. Marlin also hates seeing bad chefs or poor cooking, and will often fight those who insult his cooking. He has a fondness for eating squid and fried kelp, and loves to swim. He tends to not care as much about romance as a whole, though he is not above flirting with women of all types and races if he finds them attractive enough. 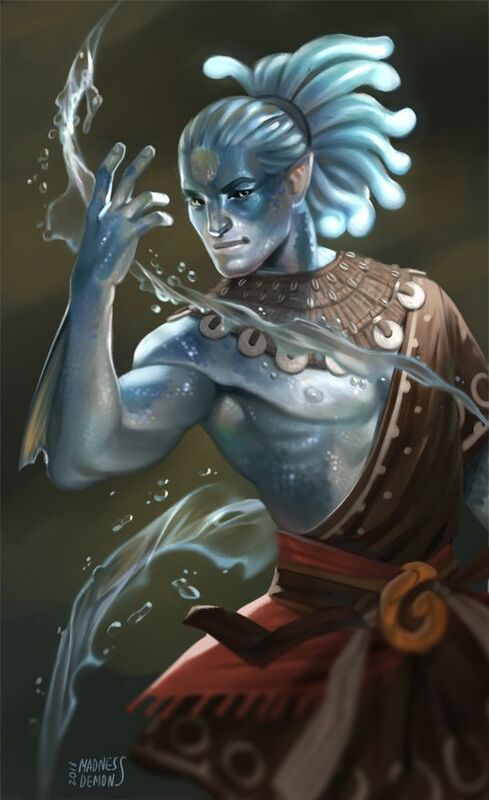 Fishman [Blue Shark mix] (2 Traits) - Fishmen gain the benefits of the Mighty Strength trait, and may breath underwater. Their movements in water are not hampered as greatly as normal humans, and they may swim at great speeds. They also gain attributes or natural weapons based on their species. The number of traits needed depends on the species. Natural weapon(s): The usual shark-like teeth capable of regenerating lost teeth, but nothing else otherwise.